Sergeant James D. Shepherd joined the Oregon State Police as a recruit on June 5, 1957 and was first assigned to Tillamook. He was promoted to corporal in 1972 and to Sergeant in 1975 and was the Astoria assistant station commander in 1980. During his years of service he was also assigned to the St. Helens and Astoria offices. On May 20, 1980 sergeant Shepherd and his 17 year-old son were out cutting firewood in the woods near Astoria. While they were traveling along a dirt road they noticed a man on foot crossing the road. They called out to the man but he disappeared into the woods. This incident troubled Sergeant Shepherd as it was unusual to see someone on foot in this area as there were no cabins or homes and the properties were owned by Crown Zellerbach and Boise-Cascade timber companies. They had not seen any other vehicles in the area. Sergeant Shepherd later discussed the incident with a friend and then also with his superior, Lt. Phillips. He suspected the man of being involved in illegal drug activities or growing marijuana in the remote area. On the afternoon of May 22, 1980 Sergeant Shepherd decided to go back to the area in civilian clothes in order to avoid being recognized as a law enforcement officer. He rode his personal motorcycle up into the forest and when rounding a corner he was shot and killed by Michael E Sture. A statewide manhunt was successful in capturing the suspect and he pled guilty to the charge of murder and was sentenced to life in prison. 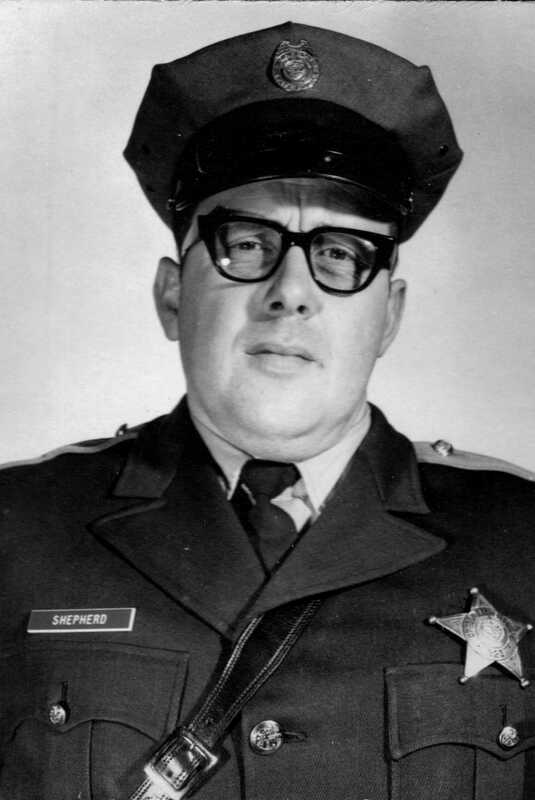 James D. Shepherd was born October 9, 1930 in Indiana to Delbert E. and Martha E. Shepherd. James, his three brothers and parents moved to the Oregon coast where finished high school at Astoria High in 1949. He was a member of the United States Air Force for 3 years during the Korean War. He worked for several years in the Astoria area before joining the Oregon State Police. Sergeant Shepherd was married and had two children. He was survived by his parents, brothers, wife and children and several nieces and nephews. Sergeant Shepherd was buried in Ocean View Cemetery in Warrenton, Oregon.